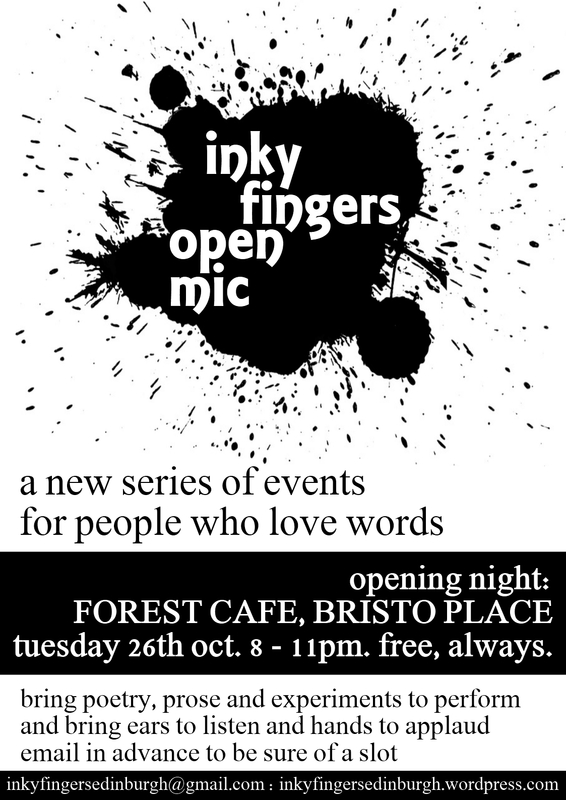 I’m very excited to announce Inky Fingers, a new series of events in edinburgh for people who love words. At Inky Fingers we believe in throwing words wide open: we want everyone to be able to create with language and share their work. We care about supporting and encouraging writers and spoken word performers, creative experimentation, building communities of writers working together to create, and putting on fantastic events that celebrate language. We’ll be taking sign-ups for performances on the night, but to be sure of a place (we’re expecting high demand!) then e-mail inkyfingersedinburgh@gmail.com in advance. You can find out more at http://inkyfingersedinburgh.wordpress.com/ . Also, join the Facebook group at http://www.facebook.com/group.php?gid=101994993200164 to get regular updates, or send us an e-mail at inkyfingersedinburgh@gmail.com to join our mailing list. Our next event will be the inaugral meeting of our Writers’ Group, a workshop for reading and discussing our work together; stay tuned for more information. Finally, you can spread the joy and help us advertise by circulating this call-out and poster below. Otherwise, see you there!